This is the last of the common figure packs from Wave 1-2 I have yet to review (reviews of some of the rarer ones are still coming!) and while this one has a couple great figures in it, there are also some serious disappointments too. Let’s take a closer look at the figures. 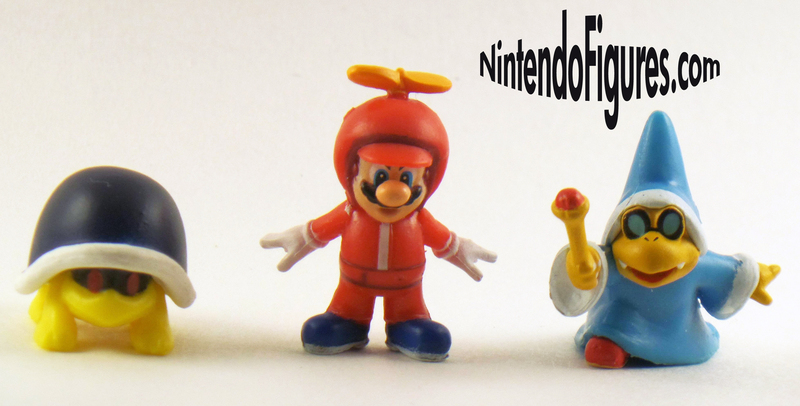 Propeller Mario – While the Propeller Suit isn’t necessarily a favorite Power-Up of mine, it is one of the more memorable ones in New Super Mario Bros. games and so it is great to see Propeller Mario as another variation on Nintendo’s lovable hero. What is nice is that this is not simply a repaint. Mario’s suit and hat are completely different and his pose is perfect for this Power-Up. My figure does have some small paint issues like on his belt and the white on his shoes is poor, but overall, I think this is one of my favorite Mario figures and it is one I would absolutely incorporate in a level because he is clearly just about ready to jump into action. Buzzy Beetle – Since I grew up playing Mario Bros. 3 and still consider it to be my favorite Mario game, I was thrilled to see Buzzy Beetle now has a figure. The paint job is simple but effective and I like how they painted in the shadow on the face. My only complaint with Buzzy Beetle is that my figure has a really bad piece of missing plastic at the back (which you can see below) where they cut the figure from the mold. Hopefully, this is not a common issue, because there is no way to check it before you buy and open this figure. Kamek – Also known as Magikoopa is another iconic Mario villain and one who always makes any level he appears in harder. I love the pose of Kamek and the sense of motion. He looks like he is ready to cast a spell and try to stop Mario. Kamek also has a really neat paint job with few flaws. If you’re planning on buying this figure pack, check the glasses which are the most likely part of Kamek to have paint problems. The big complaint and what really disappointed me is on the back of Kamek. The product number is shown there in a very obvious place. I don’t know where, besides the bottom it could have gone, but what other line of figures would do something like this? Jakks Pacific cannot appeal to collectors and have something like this in such a noticeable place on a figure. 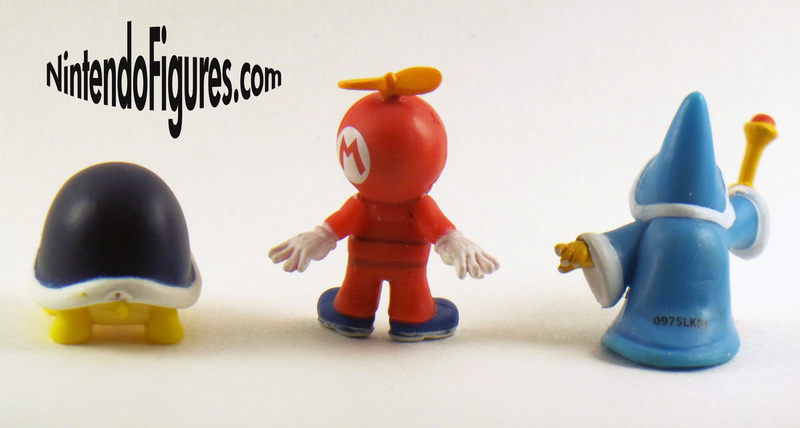 Closing Thoughts – While Propeller Mario is a fantastic figure and Buzzy Beetle is another great addition, Kamek is a major disappointment and I hope to not see anymore product numbers printed in such obvious places on Micro Land figures. While this is definitely not my favorite figure pack, since two of the three figures are of a high quality I can recommend it, but not as highly as I hoped. Some of the other figure packs are higher quality or have cooler characters, but if you like the characters here then it is worth owning.